Monday’s are fun days! Said no sane person, in the history of the world, EVER! Luchae no likey Monday. My spreadsheet brain, however, finds Monday to be the sweeeet metaphorical reset button hidden away in the folds of life. I mean, Monday’s are the BEST days to do stuff like start a new diet or draw up a fresh to do list. In the deep recesses of my administrative soul, Monday’s rock. So in lieu of that (and to spread the love) I figured, why not make other (normal) people smile today! Nay, why not make them laugh! 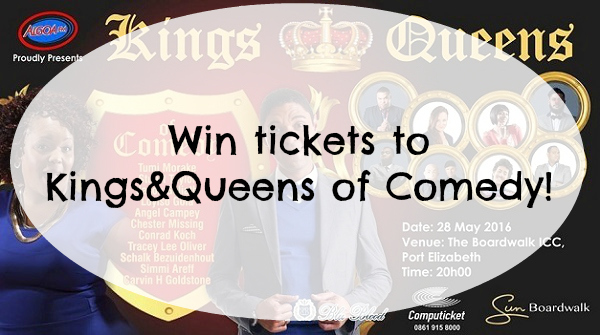 Yes, good people, I’ve decided to share all my favorite jokes with you and give you a chance to win a set of tickets to the upcoming Kings and Queens of Comedy show that will be taking place at The Boardwalk ICC in Port Elizabeth on Saturday, 28th May 2016. Did you hear about the 2 antennas who got married? It was a nice ceremony… But the reception was amazing! What did the General do with his armies? He put them in his sleevies! Bwaaaaahaha! Who needs a court jester when we have the Kings and Queens of Comedy doing it themselves? Comedy lovers can look forward to a stellar line-up of some of South Africa’s brightest and funniest stand-up comedians as they take laughter and hilarity to the next level. With his uncanny ability to cast spells of unbridled laughter on any audience, Stuart Taylor leads the pack as the evening’s MC. Joining him on stage in the royal court representing the Kings are Carvin Goldstone, Chester Missing & Conrad Koch, Jason Goliath, Loyiso Gola, Schalk Bezuidenhout and Simmi Areff. And the belles of the ball, the Queens, include Angel Campey, Tracey-Lee Oliver and Tumi Morake. 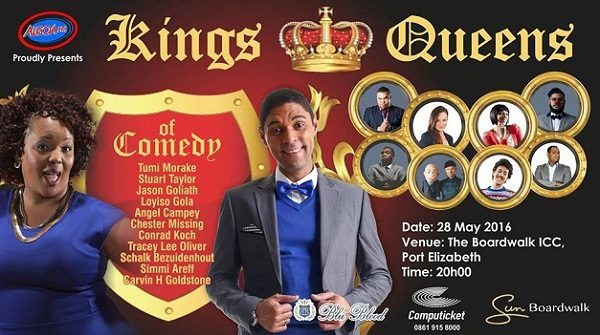 With this royal flush of SA comedy giants, this is guaranteed to be a show of hysterical proportions. If a good laugh is what you’re looking for – then make sure you get your comedy high with the Kings and Queens of Comedy.